Will you join the Pork Side? As promised, Rovio revealed some news for the birds today, a disclosure that's destined to make most fans as happy as an Ewok. 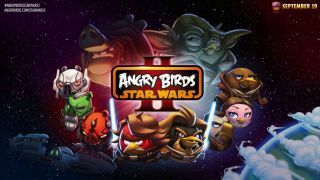 Angry Birds Star Wars II is taking flight Sept. 19 "across app stores worldwide," bringing all-new characters along for the intergalactic ride. Gamers will have the chance to play as any character thanks to more than 30 Telepods made by Hasbro. Positioning a Telepod on a phone or tablet camera scans the chosen character into the game, so players can switch roles as they wish. Feeling a little Emperor-ish? Rovio also plans to let players pick which side they want to fight for, allowing folks to join the Pork Side if they dare. Plush toys, apparel, books and accessories are also part of the ABSWII blitz. Rovio said that for now, it will not comment on rumors or speculation that Jar Jar Binks is headed to the title, so if you're not a fan of the floppy-eared alien with poor grammar, we suggest sending an email over to the game maker ASAP.